David Beckham already has an impressive collection of body art, but this week, the model and soccer icon revealed a brand-new tattoo on his hand inspired by lyrics from Jay-Z and Beyonce’s On the Run concert tour.The new David Beckham tattoo was unveiled during a book-signing event for luxury menswear store Belstaff in New York City, and features the lyrics “Dream Big, Be Unrealistic” inked in an elegant cursive font on his right hand. David’s new hand tattoo is located just below the model’s “Victoria” hand tat, which he added to his collection back in September 2013, exactly one year ago! 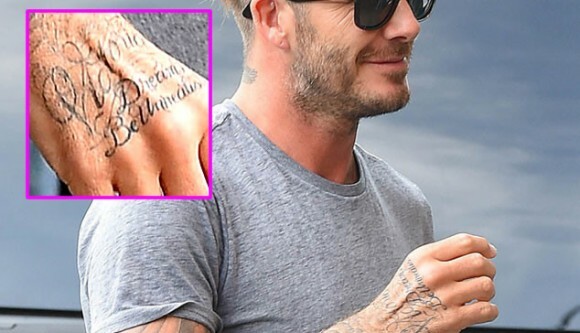 Apparently, Jay-Z’s lyrics resonated with David as well as his wife, because on September 9, while attending the book-signing event in NYC to show off his new range of biker jackets for luxury heritage clothing brand, Belstaff, the 39-year-old showed off a new hand tattoo reading “Dream Big, Be Unrealistic.” David Beckham’s “Dream Big, Be Unrealistic” tattoo joins a number of other tattoos the model already had inked on his hands, including the “Victoria” and swallow tat on his right hand, and the “Love” and swallow tat on his left hand. Since retiring from his soccer career, David Beckham has really dedicated his time and energy to the fashion industry, much like his wife, Victoria, and the new clothing line he designed for the Belstaff brand represents a big part of his life. “I have always been involved 110 percent,” David Beckham said about his new capsule collection, which includes leather motorcycle jackets, distressed jeans and classic white tees. “People know that it’s what I would wear and that’s why people have loved the collection the way they have.” Even though developing a fashion line and taking care of a family of six must be pretty time-consuming, David obviously still makes time to add to his rapidly-growing collection of ink!